When you’re new to ClickFunnels, it’s easy to get overwhelmed. The software can be a little intimidating when you first try it out. And once you’re up and running, you still might be unclear about how exactly to use it to help your business. Do you want to sell your own product or service? Perhaps you want to build funnels for other clients? Or how about just promoting ClickFunnels as an affiliate? As you can imagine, there are so many ways you can use ClickFunnels. And for some people, that’s scary. They want some direction. And that’s why you will frequently see people in the ClickFunnels’ Facebook groups asking around what the best training for ClickFunnels is. But now there’s only one right answer to that question. And the answer is the One Funnel Away Challenge (OFA). I’ve been through the training a couple of times now, and it’s really changed my business. So in this review I’m going to show you everything you’re going to get as part of the challenge and how it’s going to help you. What’s Else Do You Get With the One Funnel Away Challenge? If you’re already ready to buy, skip to the end of this review and grab my $16315.95 One Funnel Away Challenge Bonus Package. The One Funnel Away Challenge is a 30 day training that guides you step by step on launching your first (or next) funnel. The training is provided by your three coaches. Russell Brunson, Julie Stoian, and Stephen Larsen. Russell of course, is the co-founder of ClickFunnels and his videos in the challenge are all about teaching you the strategy and the “why” behind that days mission. Julie Stoian, a 7 figure entrepreneur herself, is the 2nd coach. Her videos show the “how” part of the training. So she goes step-by-step in her videos to guide you how to actually implement what Russell talks about in the previous lesson. And finally the 3rd coach is Stephen Larsen. He conducts the live group calls and is basically your accountability coach. If you are familiar with Stephen at all from his podcast, you’ll know that he’s always full of energy and makes things fun. There are 5 weeks worth of lessons in the challenge. The first week is the pre-training which will get you in the proper mindset for the reset of the challenge. Then over the next 4 weeks you will get daily lessons with links in your inbox. Every training builds upon each other so it’s very important that you go through them in order. And, there’s even homework to do to make sure you are applying what you learn. The One Funnel Away Challenge is hosted inside the FunnelHacker Community. What’s nice about this is that interact directly with your fellow OFA participants. This provides another source of accountability for you to complete each days missions. Last October, I spent $100 to get my hands on the 30 Day Challenge hardcover book. The book contains a set of plans from 30 “Two Comma Club” winners, who were presented with the scenario of having lost everything, how would they rebuild their business from scratch. I got my book and it was really interesting and great. I still have it on my desk for reference. As part of the 30 Day Challenge, I also got access to something called the One Funnel Away Challenge. I would get these daily emails that were telling me about these “Missions” I had to do, but since I was pretty busy during this time, I wasn’t able to check out any of the content. However, during the last week of the challenge, I finally got a chance to watch the first OFA video titled ‘Offer Hacking’. Wow, it was an eye opening first video. It literally hooked me. I thought to myself, even though I’m behind, I’m going to set aside the time and catch up with every video. There was only one problem. I didn’t know that all the content would be taken offline at the end of the challenge. Oops. What do I do now? Fortunately, I saw that all the videos were actually posted as unlisted videos on Youtube. So I quickly went through and found all the video urls and recorded them in my notes. This allowed me to work through the One Funnel Away Challenge on my own time. And it was totally worth it. Week 1 Mission 1: Offer Hacking. This was the lesson that sucked me into the training. It was all about doing research on what other successful people were doing on Facebook by looking at their ads. What was cool about this lesson is that it validated this Chrome extension idea I had in my head. And that gave me the push to build my first product, Ad Extractor, which pulls Facebook ads from any Facebook page in just one click. Week 1 Mission 4: The Lost Art of the Visual. I always knew design was important, but as non-designer I’ve always been reluctant to invest in design for my business. This lesson emphasized the importance of creating visuals to make your offers stand out. So that’s what I did. I went to over to Funnel Rolodex and hired someone to create some new design assets for me. I got designs for my entire ClickFunnels bonus stack done, and they look really nice. And I’ve seen a big uptick in my referrals since I did this. Week 2 Mission 2: The Epiphany Bridge. I was already familiar with the framework from reading the Expert Secrets book. But the lesson really hit home that I should really be incorporating these stories into everything I do. So because of this lesson I’ve been practicing following the script and you’ll notice that I’m using a lot more stories into my writing. The One Funnel Away Challenge has been such a boon for my business that when it was relaunched back again in January I paid the $100 to join back up again. Of course this time, it was mainly to get the cool OFA Challenge Kit which you’ll see below. One of the things that Russell teaches, and what you’ll learn in the challenge is to create a bonus stack for any offer. And the One Funnel Away Challenge is no different. Besides the training itself, you’re going to get a physical package sent to your house in the form of your OFA Challenge Kit. It was a big thrill when I received it in the mail the other day! “30 Days” Hardcover book. This is a 550 page book packed with detailed plans from 30 ‘Two Comma Club’ members on how they would start their business over if they lost everything. The book is amazing, and I’ve learned so much from studying it. 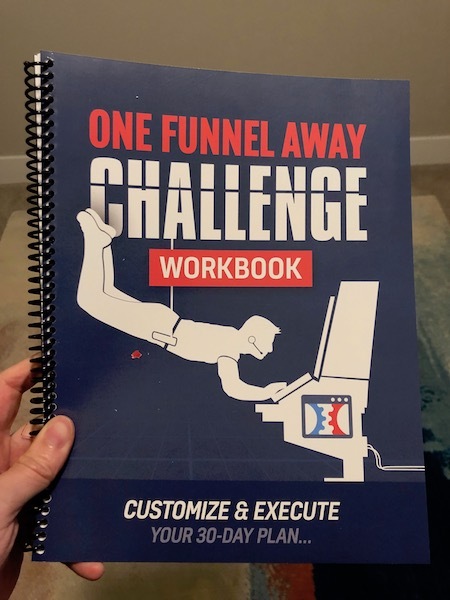 Spiral bound copy of the One Funnel Away Challenge workbook. You’ll also get a physical workbook that you can use to complement the 30 days of trainings. Inside, you’ll find a checklist of the tasks that you’ll need to complete for each days challenge. There’s also space to brain storm your ideas, and links to the videos for each of the missions. MP3 player. Inside this MP3 player are all the audio recording of both Russell’s daily trainings and recordings of Stephen’s Live coaching calls that he did during the first challenge. What’s nice is it gives you the ability to go through the challenge lessons when you’re at the gym or commuting to work. How much does the One Funnel Away Challenge cost? It will cost you $100 to get the One Funnel Away Challenge. However, you do have to pay shipping which is $19.95 if you live in the US and $29.95 outside the US. Yes, if you send back your challenge kit within 30 days of it arriving, then you will get refunded $100. But since it costs so much to ship, it’s probably not worth it to do this. I don’t have a lot of time to watch videos every day. Should I still join the challenge? If you don’t have an hour or so a day required to watch the challenge videos, then I don’t recommend signing up. It’s very easy to get fall behind, and when that happens you will have a difficult time catching up. Does it have an affiliate program? Yes, it has the One Funnel Away Challenge has a great affiliate program. It’s a super easy way to cover your own cost of the OFA. Why? Because it pays 100% commissions. So you only need to sell one course to someone else to make your money back. Since the One Funnel Away Challenge is pretty much the best ClickFunnels training at the moment, it’s a very easy sell. But I would definitely recommend going through it first, so you fully understand how it works. Do I need to have an existing product to sell to join the challenge? While the challenge is well suited for people wanting to sell their own products and services, you don’t necessarily need to have one of your own. 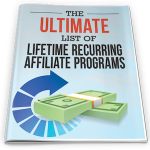 That’s because the lessons apply to selling affiliate products as well. So you could use the training to help you sell ClickFunnels or any other affiliate product if you want. I go through a lot of different courses, but the One Funnel Away Challenge was the best training I went through last year. I had so many ‘aha’ moments that I was then able to apply immediately to my own affiliate business. That’s what made the challenge so exciting for me. Just make sure you can block out the time required to go through the training. I know it’s hard sometimes because life gets in the way. Go ahead and reserve your spot now. Did my One Funnel Away Challenge review get you interested in taking the next challenge? Why not get some extra goodies by getting my exclusive OFA bonuses. Each of these bonuses will help you get the most out of the One Funnel Away Challenge training. Affiliate Disclaimer: I hope you enjoyed this One Funnel Away Challenge review. Please note that any links inside this article may be affiliate links to the OFA challenge. That means that if you click on one of the links and sign up, I may be compensated for it. If you do happen to click, thanks! Any money we make keeps this site running and allows us to keep producing high-quality reviews.